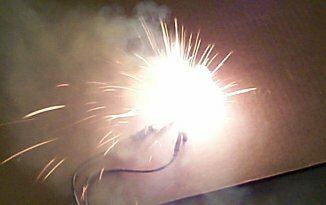 The igniters that I used for my early rocket motors (circa 1972) were quite simple, consisting of a pair of electrical wires, with a short length of nichrome wire soldered to the two leads. Since this concept does not guarantee ignition unless the nichrome wire is actually contacting the propellant grain, later igniters had a small "ball" of propellant cast onto the nichrome wire. This method of ignition was more reliable, however, there were still other drawbacks affecting the reliability. For example, if the power supply was, for some reason low (or if it was cold, such as during a winter launch), the propellant ball on the igniter would char, but not ignite. As well, since the nichrome wire is brittle, breakage would sometimes occur. There was another more significant drawback. I found that, after ignition, the motor would burn for several seconds to "build up pressure" before suddenly thrusting with full force. There was clearly propellant being wasted during this phase of the burn. This occurred because of the burnrate characteristic of most rocket propellants. The rate of burning is strongly dependant upon pressure. At atmospheric pressure, the propellant burns slowly, and only starts to burn rapidly once sufficient pressure has built up in the rocket motor. Only then does the motor produce appreciable thrust. To solve this problem of wasted grain burning, and therefore reduced performance, I then tried installation of a "burst diaphragm" in the motor. This is a thin sheet of brass that blocks the nozzle throat, and allows pressure to build up in the motor to achieve efficient burning. At that point, the diaphragm should burst and be ejected out ot the nozzle. I experimented with such a concept, but this did not work satisfactorily. In fact, such an arrangement caused a motor failure on one of my flights (Flight C-18, July 1980), The problem was in sizing the diaphragm to burst (reliably) at exactly the right pressure, which was not simple to achieve, at least not so with my narrow-throated motors. I abandoned this concept, and tried an alternative approach--to devise an igniter that would more reliably and effectively ignite the propellant, and would serve an additional function--to simultaneously pressurize the motor. A Black Powder charge would achieve this. Black Powder is easy to ignite, and by placing the charge in a sealed cartridge, it would burn nearly instantly, releasing a sizeable volume of hot gases and molten combustion products. This served to pressurize the motor while very effectively lighting the grain. The motor then achieves full thrust almost immediately. Over several flights and static tests, this pyrotechnic igniter proved to be highly reliable and significantly boosted the performance of the rocket motors. This is an illustration of what is referred to as a pyrotechnic igniter which was used for igniting the B-200, C-400 and similar sugar-propellant rocket motors. It consists of a length of polyethylene plastic drinking straw filled as shown with a charge of Ignition Powder, and as such, is often referred to as a "straw igniter". The igniter is sealed at both ends with polyethylene "hot-melt glue". The nichrome (nickel-chromium, high resistance) wire serves as the heating filament (bridgewire), and is soldered to the ends of the copper wire leads using solder. Nichrome wire is quite inexpensive (about $0.20 /ft.) . Alternatively, a strand (or two) of coarse "steel wool" may be used in place of nichrome wire, or even a strand of fine copper "speaker" wire. After stripping insulation from the electrical leads, form closed loops using needlenose pliers. Thread the nichrome wire through the loops. Adjust the spacing such that the span of the nichrome wire between loops is about 5 mm. Brush the loops lightly with acid soldering paste. Using a soldering gun, heat the loops and fill with solder. Capillary action will make this easy to do. The nichrome wire will now be embedded in solder. Use a magnifying glass to inspect to make certain that the loops are fully filled with solder. Excess solder paste is then removed by swirling the igniter in alcohol. The Ignition Powder charge that I used was a "Black Powder" mixture that was comprised of a mixture of 75% potassium nitrate, 15 % charcoal, and 10% sulphur. I now use a modified mixture, described below. The electrical power source for my firing system had consisted of four 1.25 V nicad batteries (see Launch Support System), but I then switched to a pair of rechargeable Nickel-metal Hydride (NiMH) batteries due to the excellent current delivery capability. The pair consists of two 3.6V cells (300 mAh each) wired in series which deliver a generous current at 7.2V. These cell phone batteries also have excellent cold-weather performance. Important note: Use of an igniter containing a much greater charge of BP than shown in Figure 1 may result in an initial pressure "spike". This overpressurization of the rocket motor during startup may result in motor failure characterized by shearing of the safety bolts retaining the rocket motor head. The effect of igniter size on the motor chamber pressure curve can be significant for "small" rocket motors (such as the A-100, B-200 & C-400). This is illustrated in Figure 2 for a particular BEM (Ballistic Evaluation Motor). Figure 2 -- Effect of igniter size on motor pressure-time trace and burn time. c) 15 gram igniterRef. Rocket Propulsion Technology, Vol.1, A Technique for Measurement of Rate of Burning and Specific Impulse of Solid Propellants. The Ignition Powder that I currently use is a modified Black Powder mixture, and consists of 80% Potassium Nitrate and 20% Charcoal, by weight. Sulphur is not added to this mixture. The function of sulphur in conventional Black Powder is mainly to facilitate easy ignition. This is great for flintlock guns, but for safety reasons, it is not such a good feature for rocket motor igniters, nor is it really necessary. The charcoal must be "natural wood" variety (not briquettes). The charcoal may be broken into smaller pieces by wrapping within a sheet of cotton, then striking with a hammer. These pieces may then be pulverized by use of an electric coffee grinder. The potassium nitrate is also ground to a fine powder using a coffee grinder. The two constituents are then weighed out to 80/20 (KN/Charcoal) proportions, then blended thoroughly together. I utilize the same rotating mixer as I use for blending propellant mixtures. Recommended blending time is 3 hours per 100 grams. After blending, the powder is placed in a plastic bowl, and enough water is added to form a fluid paste. The paste is well mixed by hand, then spread out onto a sheet of parchment paper, and allowed to dry completely. A mortar and pestle is then used to break the resulting clumps into coarse granular form. A flour sifter is then used to sift the granules to the required particle size. To generate a heat flux in the form of hot, dense gases which rapidly ignite the propellant grain on all exposed (non-inhibited or bonded) surfaces. Convective heat transfer resulting from the gases flowing at high velocity over the grain surface toward the nozzle exit aids the ignition process. To pressurize the chamber to a level such that the burn rate of the propellant is sufficient to maintain this pressure. Logically, this pressure level should be the design pressure of the motor. The effective force, l ("lambda"), may be calculated from the values of M and T determined from a combustion analysis (e.g. using PEP program) for any charge material. Alternatively, it can be readily determined if the impetus for a particular charge material is known. The impetus for Black Powder (commercial grade) is approximately 100 000 ft-lbf/lbm. Thus, the effective force for Black Powder is 100 000 * 12 = 1 200 000 in-lbf/lbm. If the Black Powder is not commercially made, rather prepared as described earlier in this Web Page, the impetus will probably be far less, say, between 70-80% of this value. 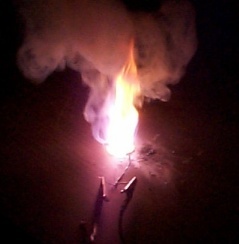 A pyrotechnic igniter, as described above, works very well for starting smaller sized rocket motors. However, for larger motors (i.e. K-class & larger), a pyrogen ignition system provide superior motor starts. A pyrogen is essentially a small rocket motor mounted at the bulkhead. Nearly instantaneous ignition of the motor grain is assured by the high velocity, particle-laden flame that emanates from the pyrogen. The pyrogen used for the Kappa rocket motor is shown in Figure 3. The grain used for this particular pyrogen is cast KNSU propellant, chosen for its ease of ignition and rapid burn rate. The pyrogen grain is ignited by a black powder charge, initially contained within the pyrogen canister by a burst diaphragm. This charge additionally aids pressurization of the motor. 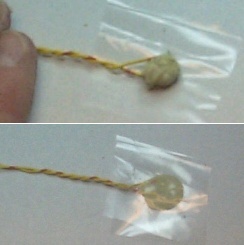 An easy to make pyrotechnic igniter can be made in a manner similar to the igniter shown in Figure 1, except that instead of utilizing a nichrome bridgewire, a Xmas-tree mini-bulb can be used in its place. This particular light bulb has the advantages of minimal cost and very small size, which conveniently fits within a soda straw, and requires only a small electrical current to fire the charge. 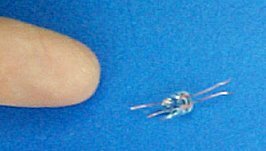 The tiny tungsten filament is instantly vaporized when current (such as from a 9V battery) is applied, and as such, is referred to as an "exploding bridgewire" igniter. This igniter design is based on a concept pioneered by rocketry experimenter Rob Furtak, who has used the Mini-bulb igniter with great success in his rocketry work. The igniter described here may be used for either motor ignition or for firing a parachute ejection charge. To make this igniter (shown in Figure 4), the plastic base of the mini-bulb is first removed (by pulling) and discarded. This exposes the two copper wire leads, which are then scraped clean of oxide, The glass bulb is then carefully broken open. The simplest means is to slowly squeeze the upper half of the bulb in a bench vise. The bulb is first covered with a cloth rag to catch the tiny shards of glass the erupt once the vacuum seal is broken. Safely glasses must be worn during this operation as a redundant safety measure. Care must be taken to prevent damage to the filament bridgewire or to break the lower portion of the bulb. Most Xmas bulbs have a very fine wire or piece of foil that is wrapped around the base of the two leads that the filament is attached to. The purpose of this "shunt" is to maintain continuity in case one bulb in a string of bulbs burns out. This shunt should be removed with a fine pick or pair of tweezers. An ohmmeter should subsequently be used to ensure the filament has remained intact (the measured resistance should only be a few ohms). Don't connect a battery across the leads -- the filament may burn up as it is now exposed to atmospheric oxygen. and soldered to the electrical lead wires. The other ends of the lead wires should then be stripped, and shunted (twisted together) for safety. Otherwise, the ohmmeter test may falsely indicate that the bulb's filament is intact. The mini-bulb is then placed within a 2 inch (5 cm) length of polyethylene soda straw, and the end nearest the leads sealed with hot-melt polyethylene glue. Ignition Powder (approximately 1 gram) is then carefully loaded, and tamped every so often to eliminate voids. The final step in preparation of the igniter is to tamp in a small ball of glass wool (fibre glass), and seal the end with hot-melt glue. Despite the fragile appearance of the mini-bulb filament, testing has demonstrated that it is very robust. In one experiment, 20 Xmas-tree bulbs were mounted (radially outward) on the circumference of a 8 inch (20 cm) disc, which was subsequently spun at high rotational speed on a lathe, subjecting the bulbs to over 120 g's. Afterward, the bulbs were tested and all were found to function normally. The following is a description of an igniter that requires very low electrical power, requiring only 20 mA at 1.2V (= 25mW) to fire. As such, this design is exceptionally reliable and especially useful in cold weather operation, which greatly reduces a typical battery's available power. This igniter may be used for either motor ignition or for firing a parachute ejection charge. The "Ultra-low Current Igniter" was developed for EARco (Experimental Aerospace Research) by Ken Tucker to increase the safety of Rocketry. Safety is paramount in rocket experimentation, and so for reliable operation of parachute ejection systems, 2nd stage ignition, and for any system that may create a hazardous condition in the event of an igniter malfunction, a very reliable, redundant igniter may be desirable. Based on Radio Shacks Part # 272-1139 Mini Lamp (or equivalent), a 1.5 Volt, 25 Milliamp electrical igniter is described. 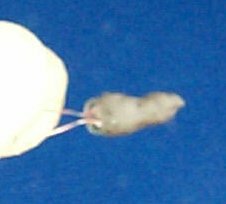 These lamps come equipped with pre-attached wire leads to facilitate hook-up (see Figure 5). In practice, the lamp will only require 1.2 Volts and 20 Milliamps to function. Record the resistance of the bulb using an ohm meter, a reading of, 20 -30 ohms is usual. 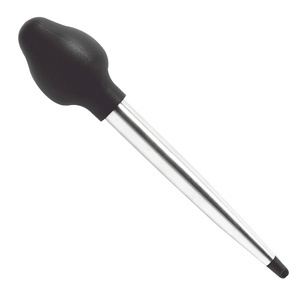 A hole is ground through the lamp bulb by carefully grinding the bulb on a fine file or polishing stone. A magnifying glass is a handy tool to check the progress of the grind. This requires some patience but after a little practice requires a total of 5 minutes. As the glass is ground, a hole will occur, at that moment the vacuum within the bulb draws in the air and some of the glass shards. To prevent the glass shards from impacting the bulb filament, the glass should be ground with the filament perpendicular to the hole. Once a hole is observed, recheck the ohms reading of the bulb. It should be the same as previous. Carefully place some black powder into the bulb through the hole. Just enough to be loose is fine, packing in too tightly could damage the bridgewire. The bridgewire will explode when heated and will land on the powder, so the powder does not need to be in direct contact with the bridgewire. Take an ohms reading again to make sure no damage was done to the filament. A little Scotch tape over the hole keeps the powder in. When fired, the igniter will produce the equivalent of a match igniting, exhausting through the hole. This may be insufficient, so a secondary burn may be desirable. Place the igniter in a tube an inch or so long, about the same diameter as the igniter. Fill this with black powder, and seal the ends. This amplifies the potency of the igniter (see mini-bulb igniter, described above). This igniter is quite shock-proof. Hard data is lacking, but this igniter survives being thrown against a concrete surface, which causes a few 100g's of deceleration. Its very low current and voltage requirements allow for numerous redundant igniters in parallel with the ignition power supply. For example 3 igniters will only require 1.2 volts and 60 ma (3 x 20 ma) to function. A semi dead "9V" battery (5.1 Volt with mini x-mas bulb load prior to freezing) was placed in the freezer at -4F for 6 hours. Using the mini x-mas bulb, with a resistance load of the igniter found the voltage to be 2.5 volts. It was very dim using the mini x-mas bulb. Connecting an "Ultra-low Current Igniter" to this dead frozen battery and it exploded instantly. 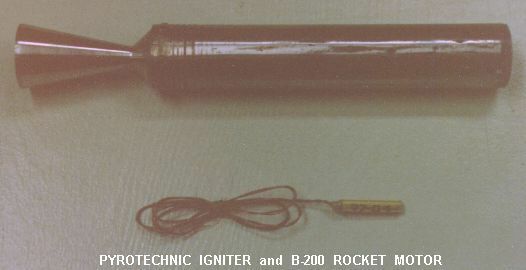 During the development phase of the RNX epoxy composite propellant, it was learned early on that the "BP straw" igniter (described above) was not suitable for igniting RNX propellant grains. As this epoxy-based propellant has a higher decomposition temperature, a hotter and more sustained burn is necessary. The solution that arose was an igniter that used a more energetic oxidizer together with epoxy as a binder. The resulting product, aptly referred to as a Ferocious igniter, burns with a hot flame for a duration of about two seconds, reliably lighting an RNX composite propellant grain. A small quantity of epoxy mixture is prepared, using the manufacturer recommended resin/hardener ratio. One half gram of epoxy is sufficient for 4 or 5 igniters. A sprinkling of sulphur is then added to the epoxy, just enough to colour the mixture a distinct yellow or light amber. The mixture is then blended well using a wooden craft stick, for a minimum of two minutes. A plastic "pan" cut from a 2 litre soda bottle works well as a disposable mixing pan. The next step is to add the KP, a little at a time, until the resulting mixture resembles a stiff paste. Squares of polyethylene sheet , 1" x 1" (25x25 mm) are cut out from a plastic sandwich bag (or similar), two per igniter. The igniter electrical leads are placed such that the bridgewire is centred onto one of these poly squares. A dab of pyrolant (approximately the amount equivalent to a pencil eraser) is placed onto the bridgewire, as shown in Figure 7. The second poly square is then placed over the pyrolant and carefully pressed down such that the bridgewire is fully embedded. The resulting thickness should be no greater than 3 mm to prevent fracture of the pyrolant coating upon firing. If the igniter is to be installed at the grain outside surface, the pyrolant should be pressed such that a thin disc is formed of approximately 2 mm thickness maximum. The disc form is recommended for both the Epoch motor and the Paradigm motor. The igniter is then set aside to cure overnight at room temperature. The poly squares are simply peeled off after curing. The cured igniters can be readily trimmed as necessary. For a more rapid cure, the igniters may be placed inside a dedicated shop oven set at 65oC. (150oF.). Curing at this elevated temperature is complete after approximately 1/2 hour. . The Ferocious igniter has proven to be highly reliable. In over 30 motor firings, not a single misfire has occurred. The Thermex Powder must first be well blended. I place the constituents into a tupperware container which is mounted to a rotating "tumbler", and allow the mixing to occur for one or two hours, depending on the batch size. The mini-bulb (Xmas bulb) must be broken open to expose the filament. I have found that the most reliable method of doing this is to place the glass ampule of the bulb into the jaws of a workshop vise, then carefully and slowly close the vise. The bulb glass ampule will suddenly fracture and leave the filament totally exposed. The glass tends to shatter so the bulb is covered completely with a suitable cloth to catch the glass fragments. Wear safety glasses when performing this step (in fact, it is a wise practice to wear safety glasses all the time when preparing igniters, especially pyrolant). I've broken open about a hundred bulbs using this method, without damaging a single filament. 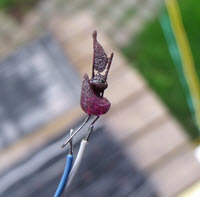 Note that most Xmas bulbs have a very fine wire or piece of foil that is wrapped around the base of the two leads that the filament is attached to. The purpose of this "shunt" is to maintain continuity in case one bulb in a string of bulbs burns out. This shunt should be removed with a fine pick or pair of tweezers. Otherwise, the ohmmeter test may falsely indicate that the bulb's filament is intact. The copper-plated electrical leads, which typically are quite oxidized, should then be lightly scraped with a hobby knife or sandpaper to ensure good electrical conduction. The Thermex Powder is then added to a small amount of neoprene contact cement at a ratio of approximately 2:1 by mass, and using a craft stick, is well blended. The resulting pyrolant blend should be as stiff as toothpaste. Using a toothpick, the pyrolant is then carefully placed onto the filament of the mini-bulb (a twirling motion around the filament seems to work well). The filament should be completely covered, and to help make the resulting igniter more resilient, the pyrolant should also extend down to the base of the mini-bulb. Working time is quite short, only a few minutes due to the high evaporation rate of the solvent, so only a few igniters should be made at one time. The igniter is then set aside to cure. Curing takes place in a few hours or even less in an environment with a slightly elevated temperature. After the cure is complete, the igniter is tested for continuity using an ohmmeter. The resistance should be approximately 3 to 5 ohms. Prior to storage of the finished igniter, the leads should be shunted (twist the leads together) for safety. The Thermex II powder is first well-blended using a rotating tumbler. To make Spitfire II pyrolant, Thermex II is blended with 20% (by mass) of neoprene-based contact cement, and allowed to fully dry. The product is then granulated and used in a standard "straw" igniter or may be dissolved in MEK or acetone for dipping. Hot-burning formulations that produce liquid (and/or solid) products of combustion are useful for igniting hard-to-light formulations such as composite propellants. However, hot-particle formulations are also useful for rapid startup of motors with conventional sugar propellants. The first two formulations presented here are conventional thermites (see Thermite Experiments ) and the third is based on a pyrotechnic igniter formulation described in reference . This is a high-energy formulation that burns extremely rapidly and produces molten copper and aluminum oxide as combustion products. Very little gas is produced and as such make for a "shockless" igniter. This formulation was used for igniting many of the early sounding rockets, such as ASP I, ASP II, ASP III and Super-Loki Dart rockets . The stoichiometric mass ratio of copper oxide to aluminum is 4.56:1. This formulation is rather hard to ignite, but can be successfully ignited with a mini-bulb exploding-bridgewire initiator. For safety reasons, a batch of no more than 10 grams should be prepared or stored at one time. This is an alternative copper themite that burns somewhat less fiercely although it has a similar energy delivery. Coarser magnesium should be used for safety reasons, such as 60 micron (240 mesh). This formulation can be readily ignited with a mini-bulb exploding-bridgewire initiator. For safety reasons, a batch of no more than 10 grams should be prepared or stored at one time. Micro-fine teflon powder is available as a piano knuckle lubricant and cost $6 USD per ounce (28 grams). The reliability and performance of a solid composite rocket motor depends partially on the composition and design of the electrical igniter. Ignition Powder (KNO3/Charcoal) based igniters, referred to as IP igniters, continue to be used successfully in potassium nitrate/sucrose (and other sugar-based) motors because they are easy to make, relatively safe, reliable and provide for fast start-up of the motor, but fall short when used with RNX and other composite propellants that are harder to ignite by their very nature. 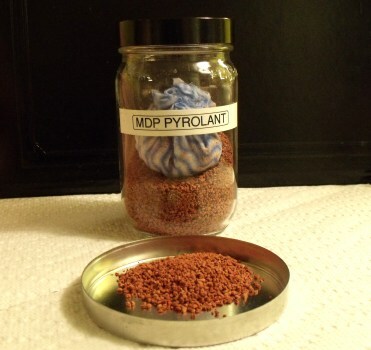 The MDP pyrolant, which is an acronym for "Modified Dan Pollino", is a pyrolant that is well-suited for igniting sugar-propellant. This formulation is based on rocketeer Dan Pollino's standard igniter pyrolant for his motors. Simple to make and uses common materials, it burns with good vigour and is reliable and easy to initiate. I have used this formulation to power my "MDP Pyrogen" igniter. The above ingredients are blended into 100 ml water, placed in a pot (or deep-fryer), and boiled to drive off water. When product reaches wet paste-like consistency, heating is stopped. Product is spread onto aluminum foil and allowed to fully dry. 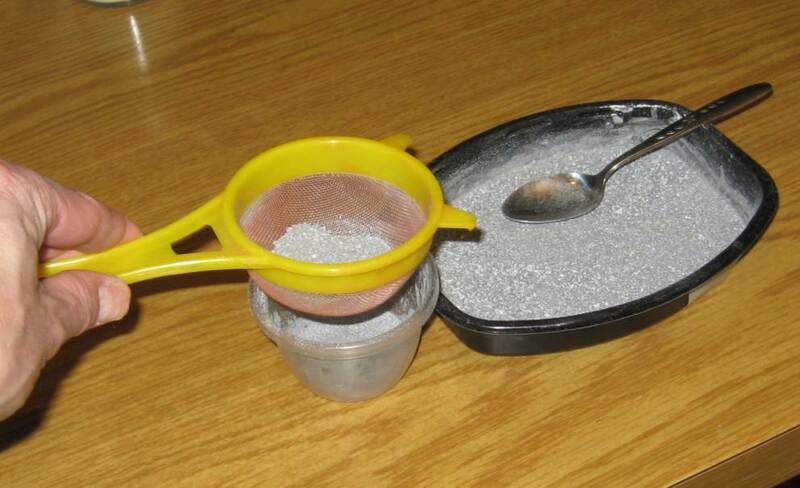 It is then granulated to a particle size in the range of 10-60 mesh. The product should be stored in a sealed container with a silica-gel pack to keep it dry. This is a very simple pyrogen unit that I have used regularly to fire my Impulser rocket motor. This pyrogen style igniter brings the motor up to pressure nearly instantly, maximizing motor performance. This unit consists of a plastic drinking straw loaded with MDP pyrolant. To fabricate this igniter, a length of plastic tube is cut and one end closed with a small packed wad of tissue sealed with hot glue. MDP pyrolant is then firmly packed into the tube using a wooden dowel. Loose MDP is then added and a nichrome bridgewire assembly is inserted. The end is then closed off with a dab of hot glue. Two slits are then carefully cut into the side of the tube to act as 'nozzles'. The pyrogen is then inserted into the forward end of the rocket motor. When the igniter is fired, jets of flame emanate from the pair of slits, rapidly igniting the motor grain. The pyrogen burn duration is approximately 1/2 second. A number of hot-burning igniters featured on this webpage use metallic aluminum as a thermic agent. Flake (or leaf) aluminum is best for igniters, igniting more reliably than atomized (spherical) aluminum powder, such as West Systems 420. Spherical aluminum requires greater thermal energy to start burning due to its relatively thick shell of aluminum oxide. Flake also tends to ignite more readily due to the particular shape of its particles. Only problem is, flake aluminum can be expensive or hard to find. Fortunately, in the true spirit of experimental rocketry, a source of flake aluminum is as close as your nearest Home Depot or hardware store. Aluminum paint is largely a mixture of linseed oil and metallic aluminum flake. According to various MSDS's, such paint contains 20%-30% aluminum, by mass. I first gave thought to the possibility of extracting metallic aluminum from paint some years ago. Early attempts were not very successful -- the challenge of efficiently separating the metallic aluminum pigment from the linseed oil base seemed daunting. Recently, I tried a different and rather simple approach, with excellent results -- a nice harvest of flake aluminum. From my own experience, a typical harvest is around 15%-20% of the paint mass (depending on brand), taking into consideration that some aluminum is lost in the extraction process. 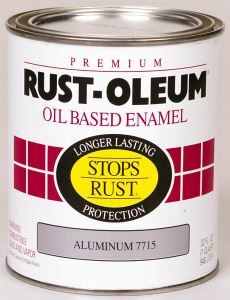 I have harvested aluminum from both TremClad and Rust-Oleum 7715 brands, with the former having a slightly higher yield. To test the product, a batch of HotFlash igniters were prepared and test fired. HotFlash pyrolant is made from 30% aluminum flake, 60% KN, 10% Sulfur and NC lacquer as a bonding medium. As hoped, the pyrolant burned fiercly, as can be seen in the videoclip at the bottom of this page. 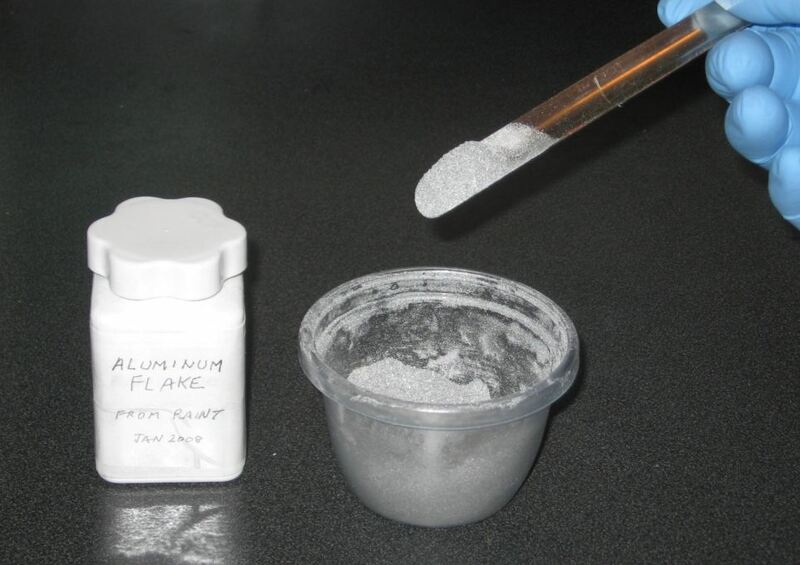 The following section describes how to harvest aluminum from a 1/2 pint (273 ml) of paint. Net harvest will typically be 35-40 grams (1.2-1.4 oz.) which is sufficient for a hundred or more igniters. 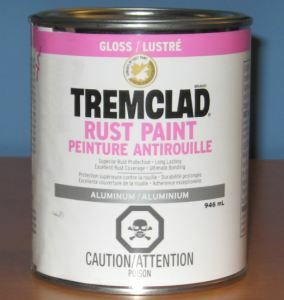 Before beginning the harvesting process, allow the tin of paint to sit undisturbed for several weeks to allow metallic aluminum to settle to the bottom. To begin the process, carefully remove the lid from the container and use a turkey baster (or other similar siphoning device) to carefully draw away most of the linseed oil base. Some aluminum particles will be drawn up, but this is not important - the net loss will not be significant. Fill the tin with acetone, then stir contents, using a wooden craft stick, for several minutes. Make sure and scrape the settled aluminum off the entire bottom and sides. Replace the lid and allow to stand overnight undisturbed. The acetone is next drawn off using the baster. Refill the container with acetone and repeat the cleansing process. The purpose of the cleansing is to remove any remaining linseed oil which, if not removed, will cause the dried aluminum to form into hard clumps. After the acetone has been drawn off a second time, tilt the tin slightly and use a piece of paper towel to "wick" away the remaining pool of acetone. 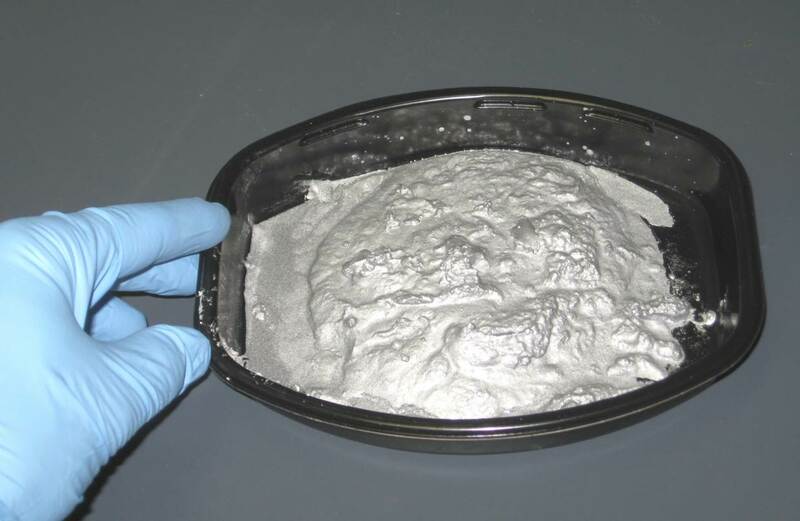 The remaining "wet slurry" of aluminum flakes and acetone are then scooped into a suitable polyethylene pan and spread out to allow the acetone to evaporate. Occasional stirring will speed up the process which will take a couple of days at room temperature to fully dry. Using the convex side of a spoon, break up the clumps to a fine powder. Using a fine nylon kitchen sifter, sift the powder to remove any clumps. Continue until all the aluminum has been harvested as a fine powder. Store in a suitable sealed container. Wear dust mask when sifting the flake aluminum. Wear nitrile or neoprene gloves when handling acetone. Wear safety glasses at all times during the process. Do not attempt to dry the aluminum slurry in an oven, as acetone is highly flammable. Do not use an electric coffee grinder to break up the clumps of aluminum. 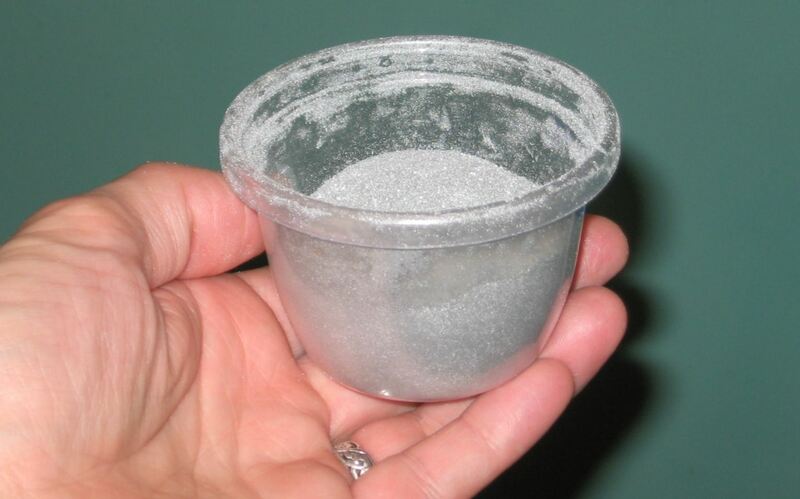 Aluminum dust is explosive and can be ignited by electrical spark. Recycle rather than discard the used acetone (it makes an excellent degreaser for metal surfaces prior to painting). Store in a glass or metal container marked "Used Acetone".